Rida loves all things Disney and princesses. She loves fairies and the magic associated with them. She adores soft toys especially Disney ones. She is big on stickers and make up. Please note both Amina and Rida do not eat non-halal meat so please be mindful when sending post. Amina was diagnosed with cystic fibrosis (CF) at 12 months old after a long struggle. She was not tested in the heel prick, as it was introduced the year after. It began with a cough and ended with Amina being in intensive care for three months. We had no idea she had CF and neither did the doctors. After three long months of guessing, we finally got the diagnosis that changed all our lives. Amina has taken CF in her stride. She is on 17 tablets a day not including the 30-odd Creon she also has to take daily. Amina also has nebulisers and daily physiotherapy. Amina has just been diagnosed with CF diabetes and now has insulin every night as well. Amina is also on overnight feeds to keep up her weight gain. She has never let any of this stop her and participates in everything at school, even though she misses a lot of it due to having IVs for two weeks in hospital every three months. Despite all this she is always smiling. Amina’s sister Rida is also a Pal and has her own page. Amina had an admission in September. She missed the start of school. Had a broken gastrostomy, which then became infected causing severe discomfort and pain. It was removed and the decision made to leave it out. She may have 1 more admission before xmas and now really struggles because she hates missing school. Rida has had a horrendous time lately. Her wounds have been so extensive to the point where we have been unable to bath her for weeks. It’s been extremely difficult to watch her cry in pain. To add to this she’s had unexplained back pain and chest pain which nobody can understand and has had so much time off school. She’s struggling to walk and her team want her to start using a wheelchair to make her more comfortable. This will benefit her, but will be extremely difficult for us as parents to see our 10 year old in a wheelchair. I’d like to thank everyone single person for their post. All the letters, cards, gifts everything. The fact that you lovely people take time out of your day to put a smile on my child’s face means more to us as parents than anyone can possibly know. Thank you. As always, a huge thank you to all those that have sent post. Amina is struggling with the heat and is losing a lot of salt through sweat. She’s drinking so much during the day but come 7.30 p.m. she’s ready for bed. She took part in sports day and came second in the shot put event. We attended the Post Pals party and it was amazing. Amina loved running about and doing crafts at the table with Lyn Clifton and her daughter. Thank you to Vikki, Dawn, Steve, Ally, Becci, and all the volunteers who helped make the party happen. Thank you for all post that’s been sent. It’s so much appreciated. Well since the last update we’ve had more admissions, surgery, holidays and then lo and behold more admissions. In February she was admitted and her peg broke, requiring urgent surgery to have it replaced. Then after 2 weeks we came home and had a holiday where unfortunately I became very poorly,so it put a massive dampener on things. Came back from holiday in April and Amina had a horrible vomiting spell and was wheezing, struggling to breathe and lethargic. We took her to clinic where she was admitted and put on IV’s and also steroids. They don’t usually like to do this. She was on oxygen for 2 days as breathing was a struggle and SATs were below what they should be. Slowly, over 2 weeks, she picked up and we are now home. We’ve managed to enjoy some of half term, but it’s taking time to get over all the illness. Thanks going out to every single person. Ellie, Beverley, Bev, Sylvia and Roy, Anna, Wendy and Charles, Rebecca, Badge, Gaynor and Ginny, too many to name, but all those who have asked or sent post, we are really so grateful, as it allows a sense of normality. Another admission for Amina and leaving Rida at home has left both girls distraught. Amina is currently on day 9 of IVs. She is obsessed with Harry Potter. Her collection of stationery is still growing too. She’s doing the O2 climb, so is looking forward to that. Rida has had numerous appointments including two cancelled as we couldn’t be in two places at once. She has two very important ones in December. Her class has started swimming and she goes with them but sits on the side and watches … Yet another reminder of how she’s ‘different’. She is an avid Disney fan and loves Care Bears. As always, massive thank you to every single person who took the time to send cards, letters, emails, and gifts. Some names: Ellie, Wendy, Beverly, Bev, Dawn and Steve, there’s so many I can’t name everyone, but thank you. 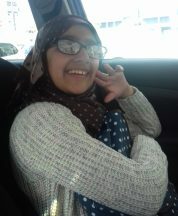 Amina had an extremely tough two week stay in hospital where the medication made her vomit too much. She spent the first three days sitting in the bathroom vomiting and lost two kilos. This is a nightmare for CF kids. Weight is always an issue. As a result she’s been put back on overnight feeds and is unhappy as it feels like a step backwards. She worked so hard to get her weight up over the years, but they have said it will be reviewed in clinic and if it’s gone up then her feeds will stop. Thank you for every last letter, card, postcard, picture, photo gifts big or small. They make more difference than ever. Thank you for Amina’s smiles box and other gifts and cards sent to hospital and my things too. These are what get us through. Massive thanks to the Post Pals team for the Extra Smiles and In Kind Direct. To Wendy, Bev, Bethany, Vicky and so many others. Without you I don’t know how we would see half the smiles we do. Amina has admission for two weeks in the next few weeks. This will be hard as she hates it now and really gets upset. Not to mention Rida getting upset because I’m away with Amina. It’s harder as Amina is in isolation and can’t leave her room for two weeks. Amina was in hospital in September for two weeks and again in December. The December stay was a huge battle as she was constantly being told different things about isolation. She ended up confined to her room for two whole weeks. This was traumatic for her as well as me. Isolation is awful. She stressed herself out so much, she lost two kilos in weight and refused to eat the hospital food. It was a struggle to get some weight on her. She’s beginning to acknowledge her CF now and it’s becoming harder for her to accept that she has to spend so much time away from school. This was her first admission since starting secondary school and she was very aware she was missing things. We have another one planned for March but I’m hoping we can do home IVs. I’d like to thank each and every person that sent letters, cards, gifts, big or small over the holiday period. Christmas was amazing and they had so many gifts. It’s overwhelming how much people who we have never met can care. Extra thanks to Vikki for this amazing page and group. Amina is due for IVs again. The doctors want to hold out for as long as possible so they have said that she will need to be in by mid November. There is currently a bug on the ward and it is shut for admissions. She is coughing and having odd vomits as well. Her blood sugars are also playing up and it’s becoming difficult to get a balance with them and her feed. Thank you to everyone who has sent post to both girls. Anything no matter the size makes so much difference. The smiles are priceless. Amina is beginning to cough and is becoming aware that she may need an admission yet again. She really is not looking forward to this as it will be her first from secondary school and she’s worried about what her new friends will think. She also is worried about falling behind. It’s going to be a tough few months. On a thank you note, I’d like to thank each and every person for all the amazing e mail, letters, notes, cards and gifts. Especially to Wendy Woo, Ginny and Jessica for their numerous gifts. Amina is again going into hospital for two weeks of IVs on 15-16 August. She’s now allergic to three so even the doctors are struggling to find one which covers the bugs she is growing. The one they are thinking of won’t enable us to go home, so we will have to stay in for two weeks.This might be an issue as Rida will still be fragile, so will need me. She is gutted as it’s her aunt’s (my sister’s) birthday on 18th August and she won’t be able to go. She has been having tummy pains and hard poos, so they think it may be the beginning of bowel problems. Her medicines have been changed so she has now hit the ‘it’s not fair, I don’t want to take them’ stage. Amina is very nervous as she is starting secondary school soon. She had an induction and loved it. She is coughing a little bit, but keeps getting tummy pains and is on the toilet a lot. This is taking its toll on her and she is getting tired easily. Unfortunately bowel problems come hand in hand with CF. I would like to thank each and every single person for their gifts, letters, cards and e mails. The look on the girls faces is priceless and it wouldn’t be possible without you wonderful people. Thank you. Amina has finally been given a date for her surgery which is scheduled for tomorrow at 1.30pm. The hospital have called in a surgeon from another hospital to help perform her operation. Needless to say, Amina is absolutely terrified and her family will be very relieved to have the surgery out of the way. Rida is struggling also, as she is very concerned for her sister, as she knows only to well about having operations and being in hospital. We’ve just got back from clinic and have been told her port has snapped inside her chest, due to high risk of infection she now needs emergency surgery. We have been called back on Monday. Her feeding tube has also stopped working and she will need to have that replaced too. She’s terrified and has spent ages crying. Amina is ok, but I can see some new cystic fibrosis related symptoms occurring. She may have a bowel blockage and this is causing her extreme pain, she is spending ages on the toilet and struggling. It’s so hard to watch and not be able to do anything. It is making her very tired and she never seems to have any energy. There is also something underlying as she is always cold and wearing many layers. She is due to have her feeding tube replaced, her port replaced and some hearing tests. On top of this she has her SATs coming up too. Thank you to Post Pals for the butterfly project. They are really enjoying that! Also thank you for the make up and the dream catcher and jewellery gift from a pal. Amina is in hospital having IVs. It’s very difficult, as she’s had another reaction to something and is covered in huge bruises all down her legs. This has really upset her. To make things worse, due to her bug she is isolated and not allowed to interact with others, or leave her room for two weeks. We are slowly getting there. On the 1st of Feb the girls unexpectedly and suddenly lost their grandad. This was devastating and we had to drop everything and catch the next flight to Pakistan. It was a very somber atmosphere and something they had not experienced before. Amina is now coughing and awaiting admission. Now that she is older and more understanding she is beginning to rebel against her condition. It’s getting harder for her to accept that she is different and has to miss so much that her friends do. She is so brave and doing very well but losing her grandad has hit her hard. I’d like to thank Ginny and Wendy and everyone else for all the post, cards, gifts, e mails, and massive thanks to Sarah Torode for the extra smiles boxes and the balloons. We just had to make an unexpected trip to Pakistan as the girls’ granddad passed away. It was so sudden and shocking, as he wasn’t even unwell. Now we are home, they are even more upset because they say granny is on her own. They are devastated and the extra smiles boxes really could not have come at a better time. They managed to put a huge smile on their faces. Amina has a hospital stay looming, so it looks like it’s another 2 weeks away….except this time to hospital. Massive thank you to Ginny, Wendy, Anne and the school in Cyprus for the presents. Also to everyone who wrote an e mail, letter, card etc, thank you all so much. Amina is doing ok, but she is aware she will need surgery on her next admission and is very upset about that. It’s something that cannot be avoided, and we are trying not to dwell on it too much until the time comes. On to the thank yous. I don’t even know where to begin! I would like to thank each and every single person for all their letters cards, gifts, e mail and messages. Massive huge thank you to each and every single person that sent cards, letters, presents and even e mails. You guys seriously have no idea of the smiles you are making possible. Wendy is our regular sender, so a huge thank you to her and also Claire. There are so many I don’t know where to start. Amina is doing well, although this never lasts long, but I’m hoping it will, as her hospital admission at the end of December was horrible. Amina is very unwell at the moment. She is coughing and vomiting and I really am trying to get her better, so she isn’t in hospital over the festive period. She’s very upset as well and crying a lot. Her sister Rida is very unwell too, so to sum up we have two very poorly and sad children at the moment. Saying this, I am hoping to take them both Lapland on Wednesday, so please send positive vibes they are well enough to go. We are in the middle of moving house and all the dust is getting to Amina. Poor child is coughing away again. We are hoping extra physiotherapy can shift any problems she has. Rida is having an extremely rough time with her legs. The wounds are extensive and are requiring daily dressing changes. She is in awful pain, when the dressing change occurs but once it’s done…the smile is back. Amina is very unwell at the moment. We are waiting on a bed in hospital so she can start her IVs. She’s coughing, vomiting and spiking the odd temperature, so hopefully we will get a bed soon. It’s Rida’s birthday on 8th October and it seems more than likely we will be in hospital with Amina during this time. There’s no way around it and we will have to celebrate afterwards. We have been given a new house so should be moving in the next week or so. I will be running backwards and forwards from the hospital to the house, as I want the girls’ room all decorated before Amina comes home, as a surprise. Lastly, there is still no improvement on my hearing and life is very difficult at the moment. Amina is unwell and is coughing. She is trying to put off going into hospital for more treatment as school has just started and she wants to be with her friends. However we are heading that way unfortunately, so it seems we will soon have (another) two week admission. Thank you for the girls’ post. We have been away almost all of July, but we are now home and Amina is due a hospital admission any day now. It seems like only yesterday she was in hospital and we still haven’t even recovered from our jet lag yet. Fantastic news! We got a call late yesterday evening saying all results are clear and Amins can come home! So I went and picked her up last night and I don’t remember the last time I slept so well! So happy my baby is home! I want to say a massive thank you to Sharon and the we love paper cutting group. Also to Post Pals for Amina’s princess game and the hair accessories lollipop which is now safely packed away to come on holiday with us. I love you all lots for the smiles you put on my girls’ faces. Words can’t describe the meaning and importance of what you’re doing for these children! Amina’s admission usually last two weeks but unfortunately she took a bad turn towards the end of it, by spiking temperatures of up to 40. She’s still in hospital and is now on day 17 with no news of when she’s coming home. She’s also in isolation. Rida is really missing her sister now as they have never gone this long without seeing each other. I just want her home now. Even I haven’t been away from her for this long. Admission started on Saturday and poor Amina had an awful reaction to the medicines. She was covered in huge bruises. It was also a huge struggle to get a remote for the TV so I could use subtitles and I ended up staring at the TV with no understanding for a good five days, then on Wednesday I broke down and had to come home (with Amina) for the night. Now she’s gone back with daddy and I’m having a few days out, but will go back soon. Poor Rida has been home and now wants Amina and mummy back home. However, now that I’m home she’s a bit better. Onwards and upwards, hopefully! Gigantic thanks to Wendy for the banners to go in their room, and especially all the care and consideration she took to ensure they are suitable for the girls! Thanks also go to Post Pals for the Wreck Journal and thank you for Rida’s dolly which she adores!! Amina is very poorly at the moment. She has an awful cough causing vomiting and on top of this she is getting nose bleeds, headaches and temperatures. We have been waiting for a bed to go in to hospital and start her IVABs since Thursday. Rida is well, but is upset seeing Amina unwell. Times are hard and frustrating at the moment and I still have no hearing. The girls are doing ok this month, although we have had some very bad news. I have unfortunately lost hearing in both ears and am now totally deaf. Doctors are baffled as it happened over 10 days. The girls are coping very well and at the moment we communicate via writing and a board. Amina writes what she wants to say and Rida just uses hand gestures. I am still having various treatments so hopefully it comes back. It has made things extremely difficult in terms of communicating with Amina and Rida’s medical professionals. Amina is due to have a hospital admission for two weeks very soon. She is very upset as this will also involve an operation. Let’s hope it goes well. Amina is not looking forward to the admission and my loss of hearing has made things worse. She knows she will be answering most questions as I am totally unable to hear. A massive thank you to everyone that sent birthday cards, letters and gifts. There are too many to name but you all know who you are and the smiles you put on Amina’s face are ones that money cannot buy. 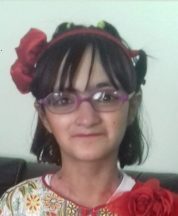 I just want to say a huge, massive, gigantic thank you to each and every one of you who wished Amina a happy birthday, sent her a card or a gift! She had a fabulous party and we have one very pleased 10 year old! A huge thank you to every single person who has sent Amina a birthday card and gift! The look on her face is priceless! Big thanks too for not forgetting Rida and making sure she’s also getting bits and bobs. Rida had surgery on her hand on 10th February and 17th February. Then on 24th February she had another surgery and rather than taking 5 teeth out as planned, they took out 7! My CFer, Amina, started coughing madly and so was admitted to our local too. Now that Rida’s had her final surgery though, we are waiting to be moved to Brompton. It seems Amina could be in hospital for her 10th birthday too! Here’s my routine for at least the next two weeks. Take Amina in to hospital every night for 9pm to have 10pm IVs, go to sleep, have 6am IVs, wake at 8am to drop her at school, pick her up at 3pm to bring her to hospital for more IVs, go home, then come back at 9pm and do it all again! Safe to say February has been a very hard month for us, but one thing the girls have had to look forward to is their post from Post Pals. We love you all!! Post Pals is doing a fantastic job and whenever we get post the girls come running and say ‘mummy is there anything from Post Pals!’ Lots of love and praises to you guys! I just wanted to say the girls have started getting post and I cannot tell you how happy they are! It was so nice to see them with such huge grins every time they got something! We have a very challenging couple of months coming up. 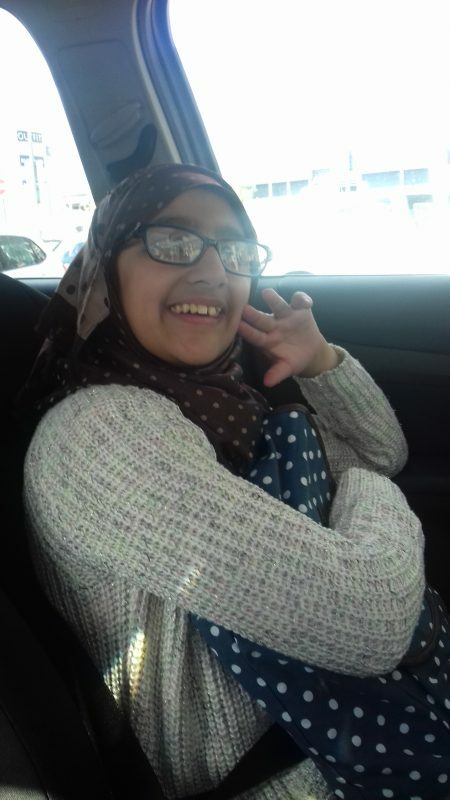 Rida has surgery on her hand on the 10th February and then needs to go back once every week for three weeks in order to be put to sleep again and have her dressings changed. She will also she will have 5 teeth removed. During this time Amina has her IVs admission and it will be very hard to juggle both sets of admissions, especially as their respective hospitals are at the other end of the city from one another. Wish me luck!